German authoress, and leader of a salon; born in Berlin in the latter half of the eighteenth century; died at Oranienburg Dec. 11, 1828. She wrote many stories, dramas, and political and moral essays in German and French, her French work being especially well received. Among her many friends were Goethe, Lessing, and Schiller. 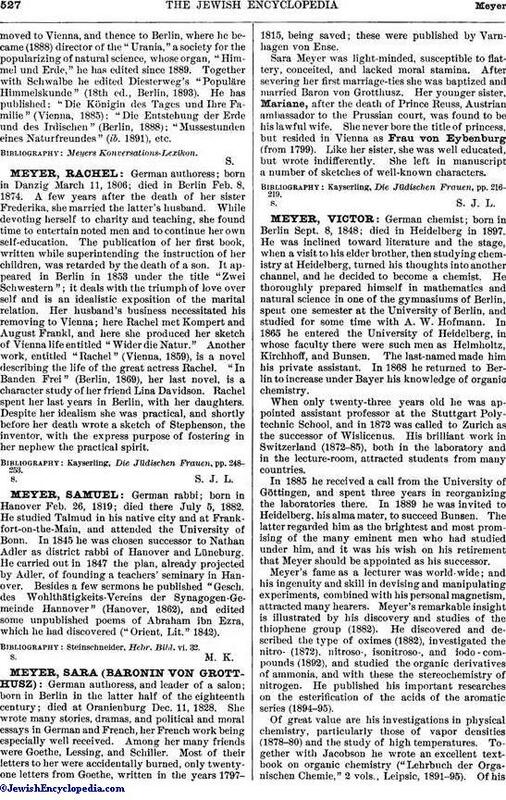 Most of their letters to her were accidentally burned, only twenty-one letters from Goethe, written in the years 1797-1815, being saved; these were published by Varnhagen von Ense. Sara Meyer was light-minded, susceptible to flattery, conceited, and lacked moral stamina. After severing her first marriage-ties she was baptized and married Baron von Grotthusz. Her younger sister, Mariane, after the death of Prince Reuss, Austrian ambassador to the Prussian court, was found to be his lawful wife. She never bore the title of princess, but resided in Vienna as Frau von Eybenburg (from 1799). Like her sister, she was well educated, but wrote indifferently. She left in manuscript a number of sketches of well-known characters. Kayserling, Die Jüdischen Frauen, pp. 216-219.